Looking for a cute alphabet matching activity to go along with a garden theme? 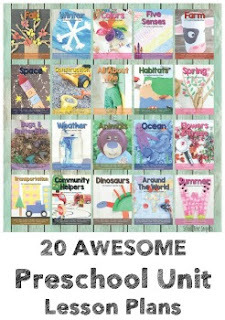 Or perhaps you plan on reading The ABC Bunny, The Carrot Seed, or The Tale of Peter Rabbit to your kiddos... 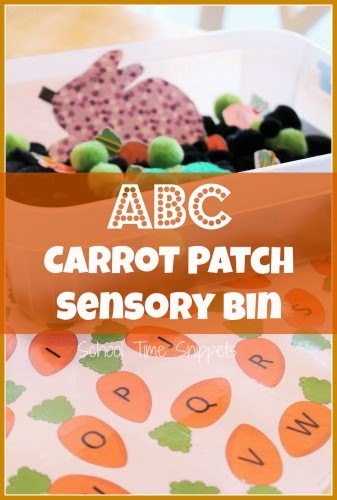 If so, here's a fun, hands-on letter matching activity reinforcing uppercase letters using ABC carrots! To add an sensory element to this activity, I set this up in a small container and filled it with pom poms and our ABC carrots. I also added in a sneaky little bunny-- I don't know who was more excited to see the little bunny pick up the ABC carrots from our pom pom carrot patch, me or Little Sis! Post may contain affiliate links. See full disclosure. I printed out two copies of my ABC carrots, laminated both, and tediously cut out all 26 baby carrots from one copy. Not gonna lie-- that took some patience! But it was worth it! The other ABC carrot printable served as a mat for matching the uppercase letters on the carrots. Next, I gathered 26 paperclips and slipped them onto each ABC carrot. I gathered my stash of black pom poms and a few green pom poms and filled them in a small container. I tucked in my ABC carrots as best as I could and attached a magnet to one of the bunnies from our Color Matching Bunny Tails Activity. I didn't fill the bin with all the carrots as the bin was a bit too small, and I didn't want Little Sis to be overwhelmed with all the matching, so I just randomly chose a few ABC carrots to add to our carrot patch to begin with. I invited Little Sis to come over and explore the ABC Carrot Patch and she loved it! I showed her how little bunny could hop into the carrot patch to find a carrot. Once the bunny pulled up a carrot, we searched our ABC carrot mat for the matching (letter) carrot. She did a great job matching some of the letters! And she also had a fun time digging up the pom pom dirt once she found all the carrots! I hope you enjoy making your own ABC Carrot Patch! Just click on the link to access your printable copy of our ABC Carrot Patch! And as always, our printables are for personal use only. Please follow proper downloading etiquette and do not distribute it as your own, but link back to this page for others to find this activity. Thank you! And lastly, a Thank You! to mycutegraphics.com for the carrot clipart! ABC Bunny is a Before Five in a Row book selection.